In recent days the Eagles have been very busy. On Monday, the team kicked off their 2010 training camp at Leigh University. Then on Tuesday and Wednesday, the signed first and second round picks Brandon Graham and Nate Allen as well free agents WR Jared Perry and S Antoine Harris. Tonight was no different as the Eagles and the Denver Broncos decided to pull the trigger on a trade. The Eagles sent backup middle linebacker and special teamer Joe Mays to the Broncos in exchange for kickoff returner/running back J.J. Arrington. As part of the deal, the Eagles will receive a 2012 sixth-round pick if Arrington fails to make the 53-man roster. Mays had been with club since 2008, when the Eagles selected him in the sixth round out of North Dakota State. Since then he had been a fixture on special teams. For the Eagles, the move makes a ton of sense considering Mays was likely going to be cut due to the log jam at linebacker (Stewart Bradley, Akeem Jordan, Ernie Sims, Moise Fokou, Jamar Chaney, Omar Gaither and Keenan Clayton ahead of him on the depth chart). Additionally, head coach Andy Reid had only had one running back on the roster with more than one-year of NFL experience [free agent pick up Mike Bell]. 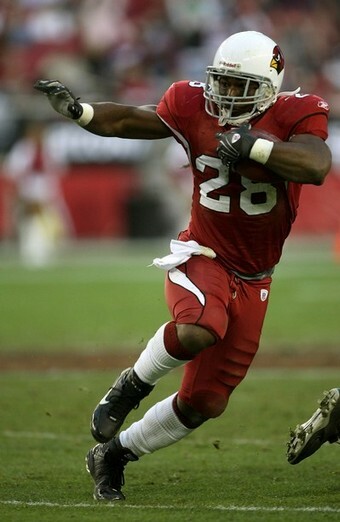 Arrington (5-9, 212) was a second-round draft choice of the Arizona Cardinals back in 2005. With Arrington, the Eagles get a versatile back that does not run particularly well between the tackles. In his first four seasons, he rushed for 654 yards and three touchdowns. Nonetheless, he can receive the ball out of the backfield extremely well like former Eagle great Brian Westbrook was accustomed to doing in Reid's west coast offense. Over that same four-year span, he recorded 91 receptions for 693 yards and two touchdowns. However, the biggest value with Arrington is his ability to make significant contributions to the Eagles’ special teams. As a kickoff returner, he has a career average of 23.6 yards per return and has taken two kicks to the house. Last season, Eillis Hobbs was the main kickoff returner, but a severe neck injury suffered on special teams caused him to miss the final eight games of the season. This year Hobbs is penciled-in as a starting cornerback and defensive coordinator Sean McDermott would prefer that Hobbs not risk getting injured in one of the train wreck collisions that occur on special teams. Also so he can focus squarely on his job at corner. With Arrington in the fold, the Eagles finally have Hobbs replacement and somebody who is just dangerous. Despite his ability to receive ball out of the backfield and return kicks, Arrington missed the entire 2009 season with microfracture surgery on his right knee. While he says his knee is "getting better every day," it is unknown if that knee will hold up once he has to take the physical punishment that comes with being a special teams player and running back. In addition, Arrington still has to pass a physical in order to even get on the practice field. Otherwise he could be put on the PUP (physically unable to perform) list like DE Victor Abiamiri, who is recovering from the season type of surgery. Whether Arrington does or does not make the club, the Eagles made a smart and savvy business decision to pick him up. Looking at the circumstances from afar, the trade looks like a win-win situation for general manager Howie Roseman. If Arrington's knee holds up and he is apart of the 53-man opening day roster then the Eagles have found an exciting return-man who can take it all the way at anytime. Plus they get themselves a nice third-down back. On the other hand, if he is simply cut then the Eagles get a sixth-round pick. A sixth-round pick for Mays is great considering he was drafted in that round and was going to be release before the start of the season anyway. In the NFL, there are not a lot of win-win situations for franchises, but he Eagles found themselves in that scenario tonight. And when a state of affairs like this one presents itself to a team, they should jump at the opportunity because in the end it could payoff huge dividends.